Grouser Bar is a type of steel bar used to restore the tread on dozers, excavators and other tracked vehicles. A worn track shoe can be regrousered up to four times, greatly extending the life of the shoe. New grouser bar from Dura-Tuff can also add height (up to 110% of the original) for added traction and increased wear life. What Does “Grouser” Refer To? The grouser refers to the protrusion on a track shoe which directly engages the ground. Grousers are intended to increase the traction of tracked machines, especially in loose material such as soil or snow. 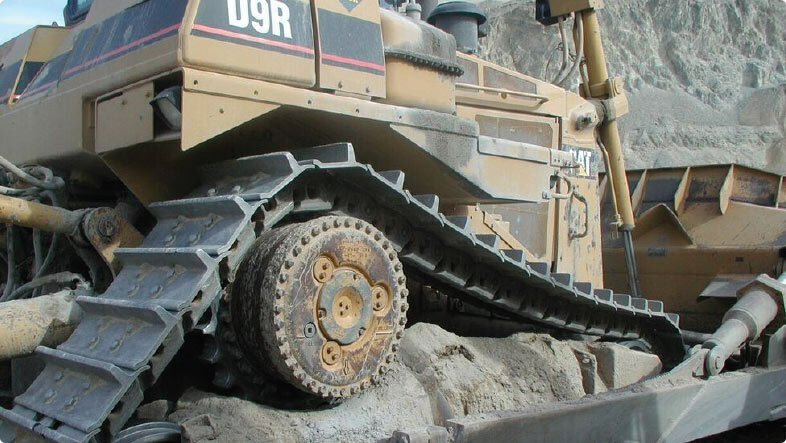 The grouser works by increasing contact with the ground like conventional tire treads, and similar to a cleated athletic shoe— giving the machine the traction it needs to push, pull, and rip through rock, sand, soil, and debris. In many abrasive environments, the grouser wears down at a disproportionate rate to the rest of the undercarriage, making the concept of regrousering a cost-effective way to approach undercarriage maintenance. Regrousering can significantly prolong the life of the track group and save thousands of dollars over the life of the undercarriage. Dura-Tuff (originally called WC Manufacturing) was started in 1986 by Wheeler Machinery Co., a Caterpillar dealer who saw the need for a quality grouser bar in the industry. Because they were already using grouser bar in their own undercarriage maintenance services, they put those years of experience to work and started making their own grouser bar. America has a rich industrial heritage and a proud tradition of steel working. We continue that tradition with a passion for making the best, most durable, and innovative grouser products in the world. We work hard every day to make products that stand up to the most abrasive environments on the planet with presence in more than twenty-five countries worldwide. We start with a proprietary boron alloy which maximizes hardness and weldability. From there the steel is cut-to-length and individually heat treated for consistent through-hardness. This process of hand crafting each bar results in steel that is up to 20 points harder (Rockwell C) than our competitor’s bar. At Dura-Tuff we have a singular focus—consistently seeking to raise the bar for grouser products.